Waiting at airports can be a frustrating affair, especially late at night. Many large international airports provide a free wifi service, if only for a limited period. Not at Ivato International Airport, the official name for the airport that serves Antananarivo. There were a number of connections with information about the stands where you could obtain a password or pay for access, but all these were closed. Not surprising, as ours (to Nairobi’s Jomo Kenyatta Airport) appeared to be the only flight to leave at 02:40 in the morning of the 10th! Flights, waiting at Nairobi and meeting up with Angie and Billy at Heathrow were all uneventful, i.e. went perfectly according to plan. Angie told us that our flight still did not exist, even though we were standing next to her. The only fact worth missing is that our flight from Nairobi was only partly filled, leaving John and I with a spare seat between us to stretch our legs for the long flight. Copying the text and images into book format, using the Blurb on-line publishing function. (nearly finished as I copied text each time that a blog was posted). Jonathan Clark has kindly offered to do the proofreading once a draft .pdf version of the book format is available. Finish planning for the next trip, a Ferothon in Mexico. Tickets for our flight on 1 February are booked and the outline route needs to be firmed up. See you all back on the Blog then – Merry Christmas and a happy New Year until then! I was a bit previous about closing the trip yesterday. For a start, John’s images reminded me that on the way to Christophe and Nadia’s home, they took us into the capital for a meal at the Cafe de la Gare, the old colonial railway station that boasted the first wifi connection for four days. There was an email message from Angie saying that the flight number for our arrival home did not exist. There were no messages from Netflight to suggest cancellations so I asked her to meet us at the airport as arranged. After breakfast Christophe took a quick look around his collection to see how his plants had survived during his absence (fine) and then John started to sort his images and Christophe and I went through my images and with the help of Christophe’s knowledge and his substantial library were able to put names to many of them including snakes and lizards – a great help! There was a good deal more that we saw than the plants and wildlife that are included in this blog. The amount that we saw and recorded is overwhelming. It is literally the case that at times we could not see the wood for the trees! By about ten o’clock, when we were in advanced waiting made, I suggested that John & I might as well wait at the airport, in the hope that there may be wifi available. Christophe took us to the restaurant at the airport where huge tevesision screens announced in French that Donald Trump had won the US presidential election. I aske3d an English speaking waitress if I had understood correctly. She smiled and said ‘yes’ and added ‘Good luck!’ Time will tell how significant in world history this result will prove to be. We again thanked Christophe for an excellent trip and reminded him that he and Nadia were welcome to visit us in the UK whenever they are visiting his Mum in France. Don’t be put off by the fact that the site is in the French language. On my laptop, if I open up a foreign language website with the Oracle Chrome browser, a right mouse click will provide the option to translate the text to the language for which your computer has been set up. Christophe speaks excellent English so once you meet him at airport, you have no language problems. 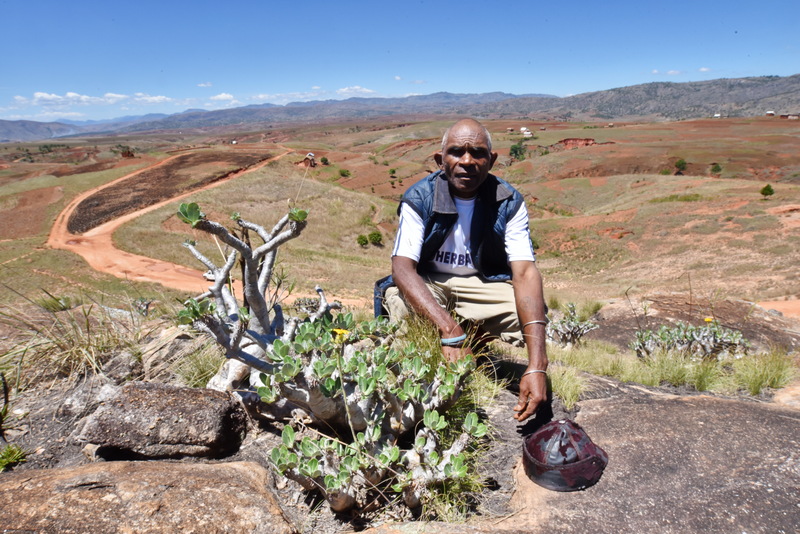 Organisers of C&S Conventions in the US and Europe should certainly consider Christophe as a speaker for lectures on Madagascar and its plant conservation issues and on a range of the island’s succulent plant genera. His favourite plant group are the Euphorbiaceae, he is fascinated by the huge range of diversity in the family – from almost invisible geophytes to tall trees. Do look out for his articles in the various specialist and general C&S journals! Jean Baptiste joined us for breakfast and to wish us a safe journey back to the capital. It was still a 390 km journey over Route 35 and RN7. All smooth asphalt? I enquired. Christophe smiled. ‘I wish!’ was his reply. 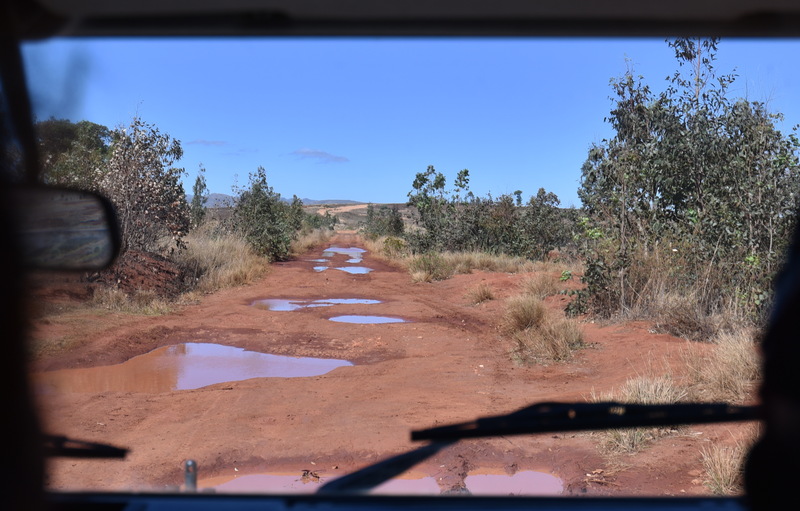 I knew from experience that it is often easier to navigate a reasonable dirt track than to zigzag along a poorly maintained hard top road trying to avoid the pot holes. We made it to Ambositra where we were able to buy some souvenirs, easier now that we had a much clearer idea of how much money we had to spare – no point taking Malagasy currency home, except samples of each of the notes to make a display in a picture frame to hang in the ‘Madagascar Room’ at home in Wiltshire. The town is well-known for a street full of artisan shops, including wooden sculptures and very attractive marquetry. We made our purchases and found a small restaurant for lunch and a beer. I immediately fell in love with a framed piece of marquetry hanging above the door: a row of Zebu heads. Where can I buy one? The owner did not know. Is this one for sale? No, sorry, it was a present from a friend. Nadia had already had lunch while John and I were shopping and went out again. She had been up and down the souvenir stalls and had tracked down a somewhat smaller framed piece of marquetry in a stall a few hundred meters away. We agreed the price and I was a happy bunny, especially as I also found a small tray, again beautifully decorated with different inlaid woods and had negotiated a good combined price for the two items. We stopped for the last time, but not for plants, at the Boulangerie – Patisserie Mirana in Antsiribe where we had enjoyed snacks and breakfast during our stay in the town at the start of our trip, nearly four weeks ago. It was a great trip, thanks to Christophe & Nadia who took great care of us and were very patient to travel at my speed. Thanks also to John for being a great travel companion, as on previous trips. As I finish off this missive, the postman has just dropped a memory stick with John’s imagesthrough the letter box – thanks John, that will keep me busy now that the blog is complete for this trip! 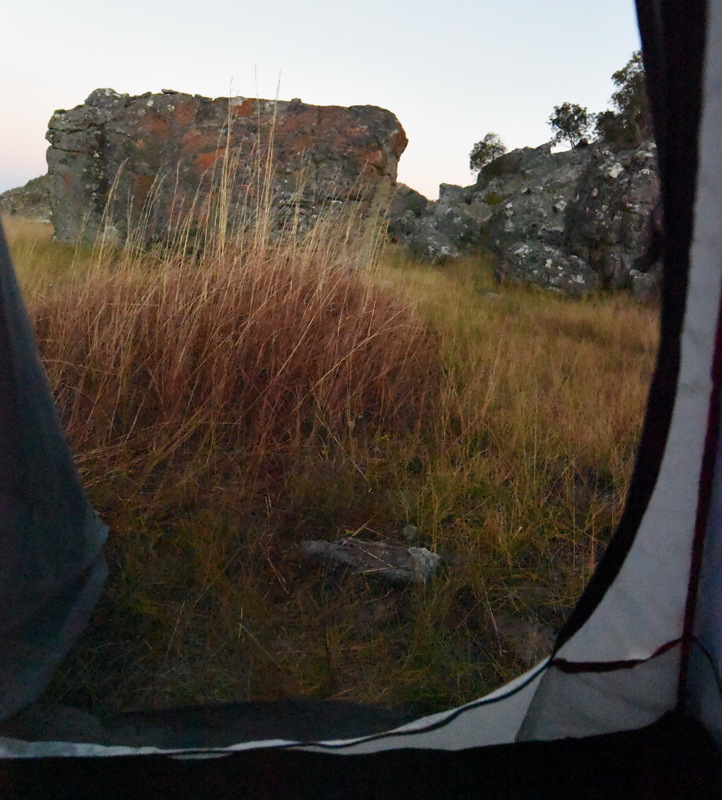 It was a bit cozy in our tent as John and I laid stuffed like sardines in ourt respective sleeping bags in our tent. Fortunately, my near legendary ability to sleep anytime, any place, anywhere was still working and I was off as soon as I closed my eyes. When I made my night time bladder run out, John had gone, including his sleeping bag. That left more space in the tent when I got back from my mission. John had left the tent soon after I had dropped off and had taken his sleeping bag to the other side of the rock that you can see above. Nadia was already preparing breakfast: baguettes, an omelette and coffee finished by freshly prepared pineapple. Is E. itremensis just a white flowered form of E. quartziticola or a good species for various reasons other than flower colour? We saw much more yellow flowers in total during our stay on the Massif then these white flowered plants. I joked and asked Christophe to show me a red flowered plant. He took us to another location but there were no red flowered plants on show. Different flowering time? I joked and asked him to show me a form with purple flowers with orange spots but he told me that he was still working on that one in Photoshop! 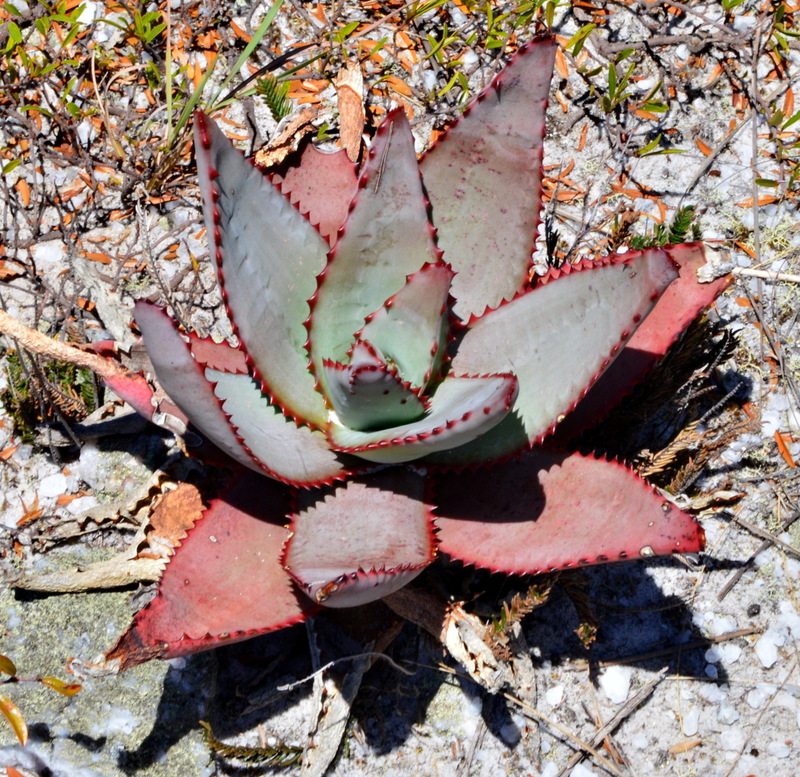 Next Jean took us to a site for Aloe erythrophylla grows. 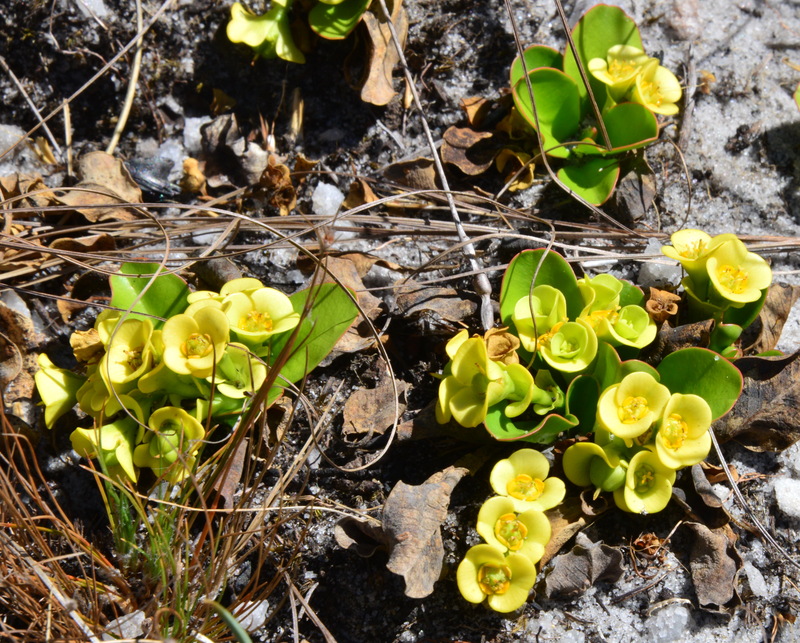 On the internet it is said to be rare in cultivation, probably as much for the remoteness of its restricted habitat – it is endemic to the Itremo Massif – as anything else. Difficult to photograph, as the visible plants were high on the rocks with the sun at the wrong angle. 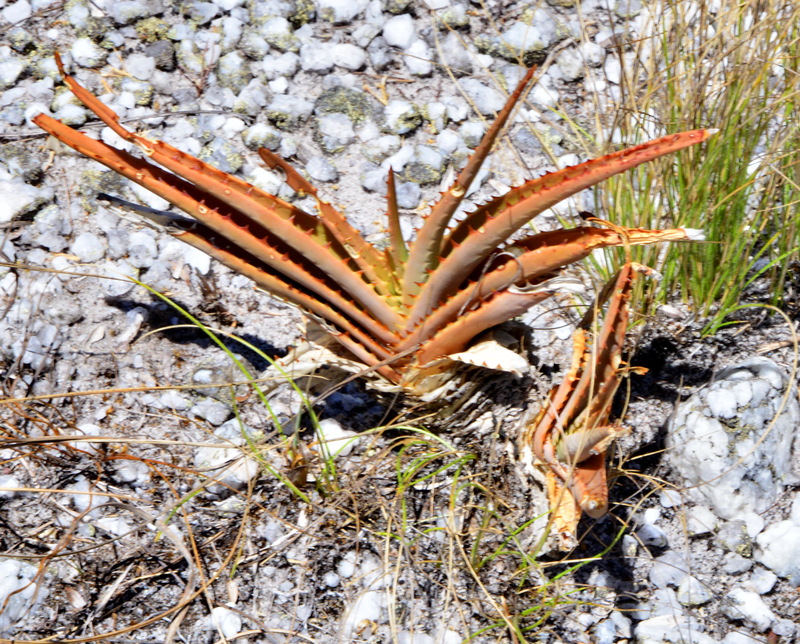 At the next stop there were two Aloe, both basking and fully exposed to the sun at an altitude of c 2,000 m, still growing on quartz. It would be interesting to know the soil pH, which for Uebelmannia populations in Brazil, also on quartz, was around pH 3.5, equivalent to strong Hydrochloric acid. Must take a field pH kit on future trips. This second Aloe differs ‘from the bunch’ seen so far by its distichous leaf arrangement that persists even on large mature plants. We did not see flowers, but the internet reports that the inflorescence is unbranched with the flowers clustered at the tip. Today was certainly Aloe Day! At the next stop we were shown Aloe macroclada. 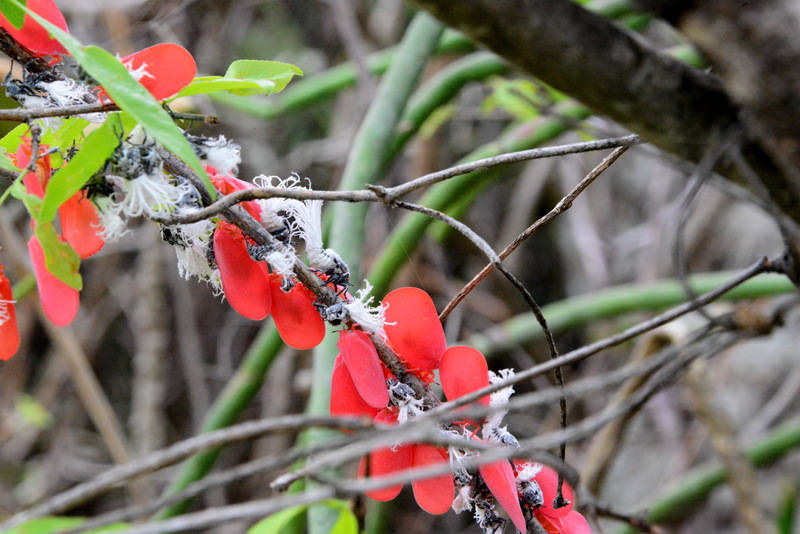 These were large plants with a large (finished) inflorescence full of seeds. 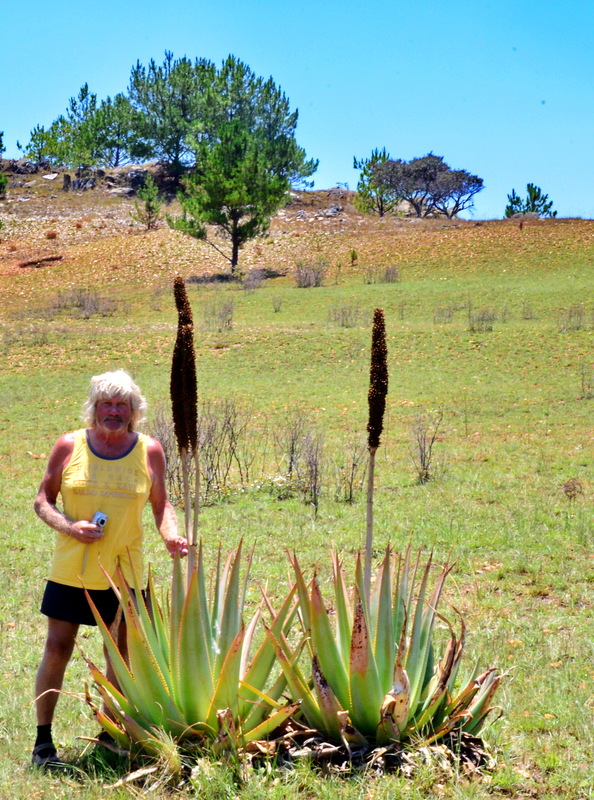 In the picture below, John acts to provide scale to show the size of this Aloe. Too large perhaps for a UK hobby glass house but should be a hit in gardens in California. 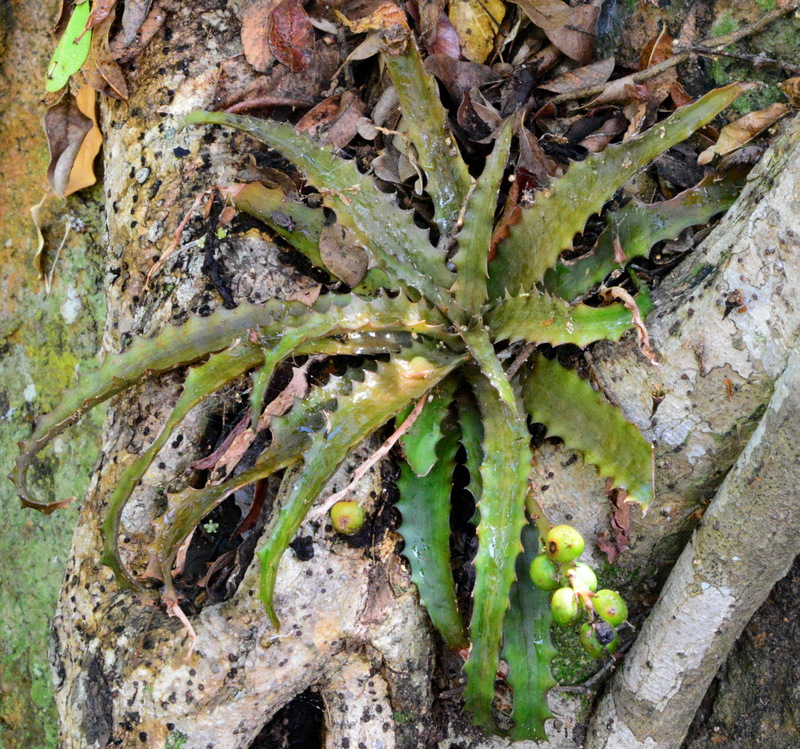 The leaves have been shown to have the same healing properties as Aloe vera that could become an important local industry. We reached the administrative office in Itremo village. Again, a crowd of curious locals crowded round. We decided to give the warm Cola a miss but did find the project representative who collected our due for our visit – well worth it! 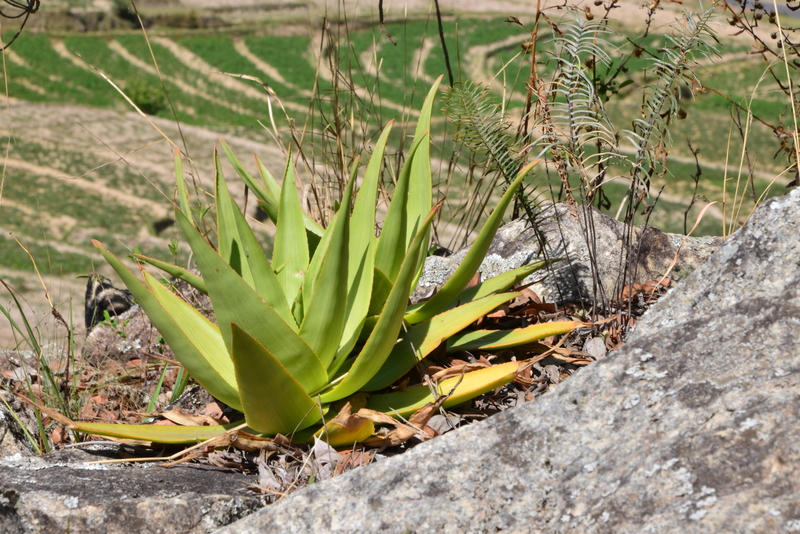 Soon after the village we stopped at the site where we did not have enough time to take pictures yesterday for another Aloe, Aloe capitata var.cipolinicola. This species is again better suited to a Californian garden than a UK hobby greenhouse! We reached the worst stretch of the track and again it was a case of ‘everybody out’ (except driver Christophe) who carefully followed Nadia’s and Jean’s instructions while John and I photographed and videoed the car’s very slow progress, often with just three wheels in touch with the track. We still had the bridges to go! I guess this is 3×4 wheel drive driving! It was so nice to get back to get back to asphalt, even though there were lots of potholes, and a nice cold THB beer back at the hotel. I know that a few days ago I would have gladly missed out on this outing, but I’m very glad that Christophe encouraged me to have made this unforgettable adventure! Thank you Christophe – fantastic driving, thank you Nadia for your great cooking and thank you Jean for showing us some great plants! And so the day of our camping adventure tonight had arrived. I packed my sleeping bag and an extra set of clothes in case it got cold at night. Christophe had arranged that we could leave all our luggage in one room in the hotel in Ambatofinandranaha where we would return after our night under canvas. We were greeted at breakfast by Jean Baptiste, a Malagasy botanist who lives in this town with the unpronounceable name (Ambatofinandranaha). John and Christophe went to see him and his garden yesterday afternoon while I stayed in the hotel to back up the images to date prior to our camping adventure – no internet of course. 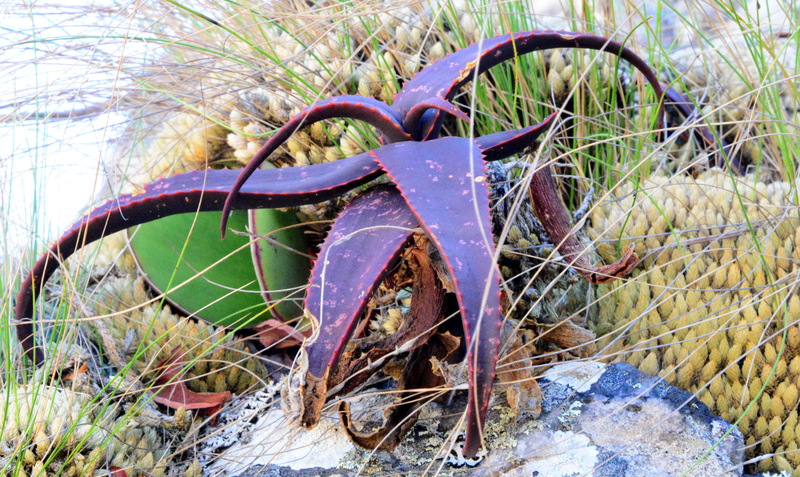 Jean has been acknowledged in a number of books including the Aloe of Madagascar by father and son team Castillon. 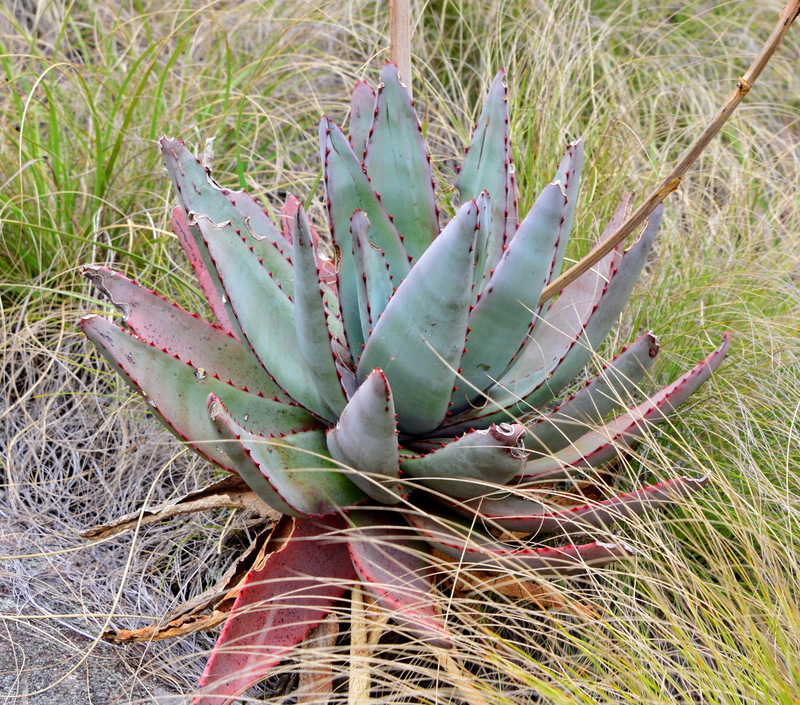 He knows his Aloes and has discovered a number of new Malagasy Aloes. Jean was with us as a guide, essential on the poor tracks. For years he had explored the area on foot. Not such a bad idea as it took us some 8 hours to cover the 40 km! 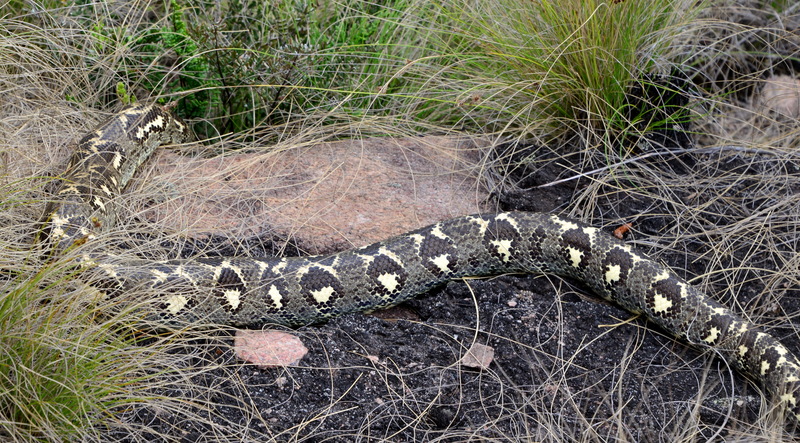 This included some road side stops to photograph plants, scenery and road conditions. 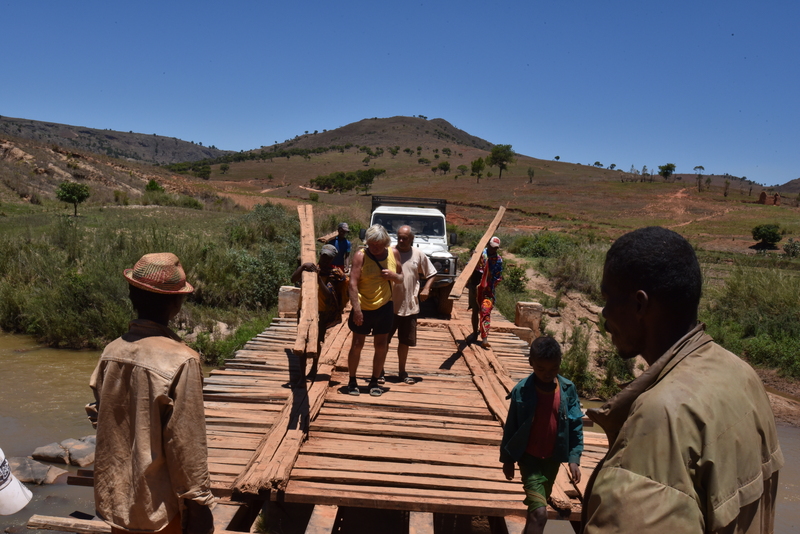 It also included a stop to rebuild a bridge, something that we had to repeat the next day, on the way back! This had better be special! It was!!! There had been some rain a few days earlier and there were still puddles on the track. This was the start of the rainy season that could turn the track into an impassable mud pool. Fingers crossed for a dry 48 hours, otherwise we might not get home in time for our flight home. We drove over the mostly gently rolling hills past small forests, rice paddies and burnt fields, always seeing two to three house settlements somewhere in the landscape. The population of the island is increasing at an alarming rate! 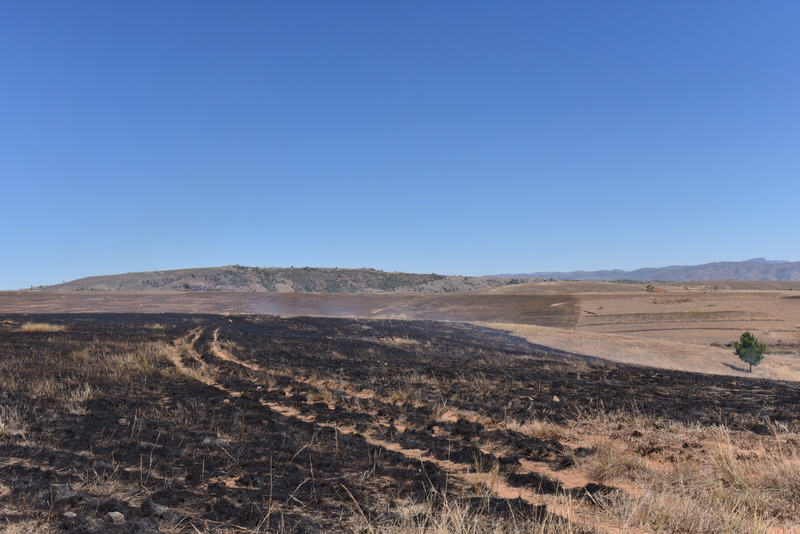 Madagascar has lost more than 33% of its forests since the 1970s and has attained the highest soil erosion rates in the world of 20,000-40,000 tonnes/km²/year. These statistics are difficult to visualise – not until you drive through the country do the figures take on meaning, as you drive past reasonably burned fields and see the large areas that are now rice paddies as the growing population tries to feed itself. 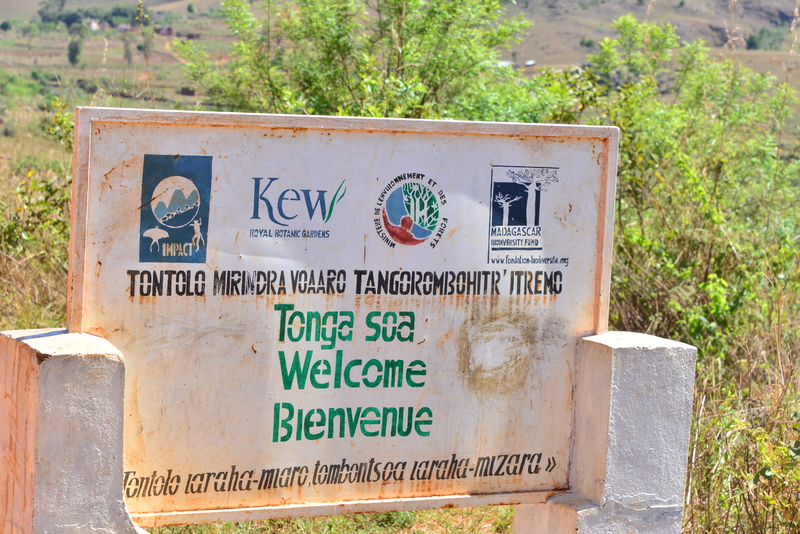 The Itremo Massif is part of a conservation project where Kew is one of the partners of a 273 km² protected area in the central highlands in Madagascar. 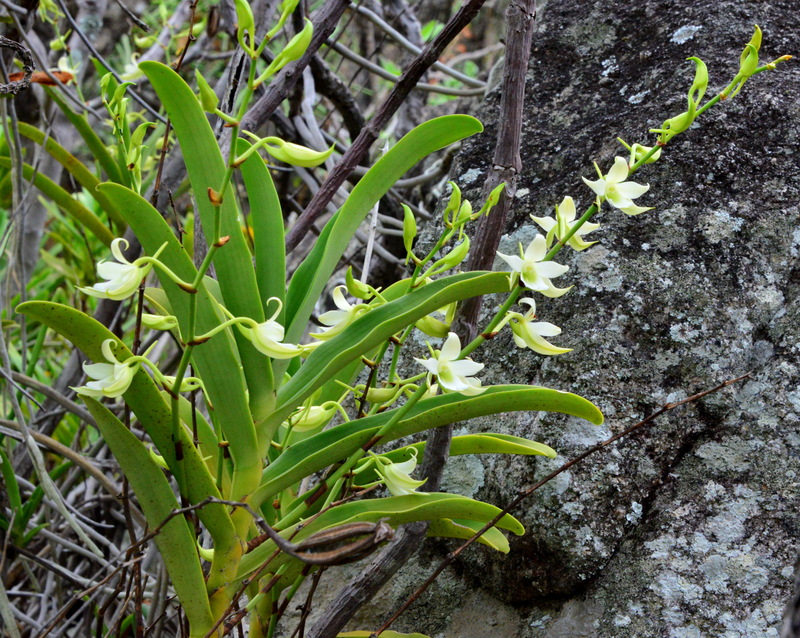 Quoting the Kew website for the project: ‘Initial botanical surveys have revealed over 560 species of plants, of which around 10% are only known from the Itremo Massif. Highlights include 3 species of lemur, 9 species of chameleon and a critically endangered frog.’ Check out the video included on the site that gives a good overview of this. Sadly, collecting of some of the species for the C&S Hobby is quoted as a major threat to the species concerned. 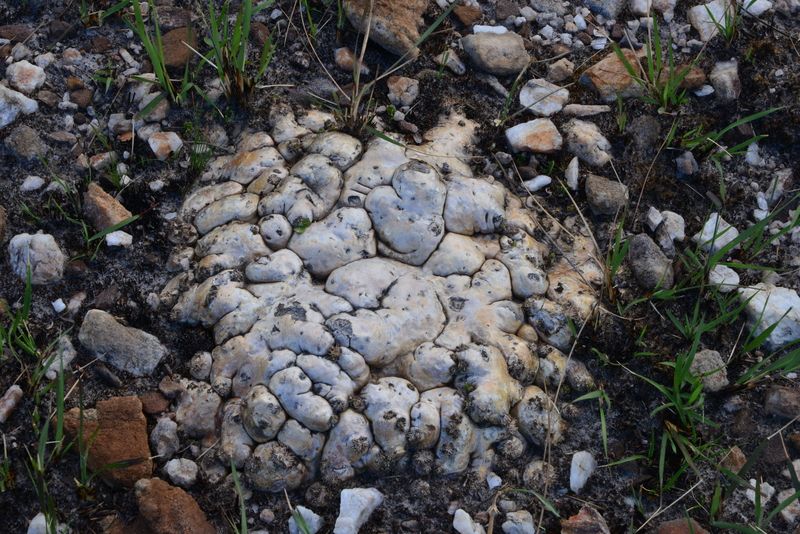 Some of the pachycauls that we saw and photographed must be of a significant age and it will take many more years for these to be replaced by nature. 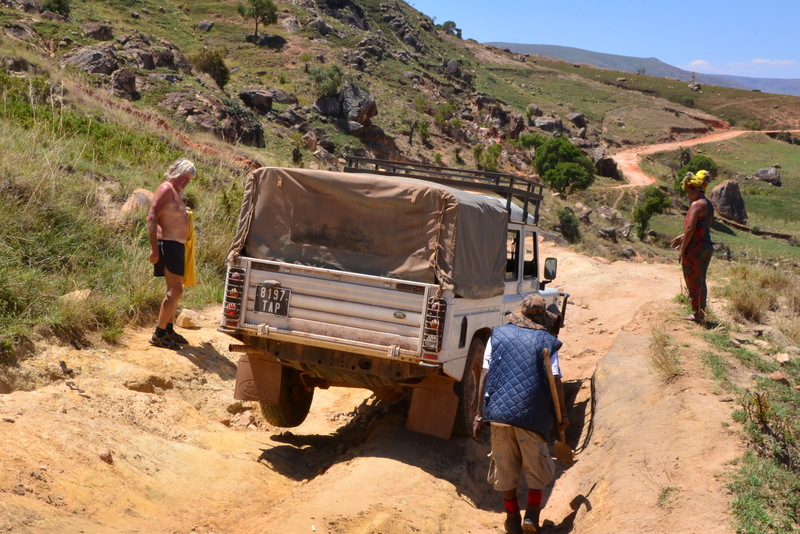 The poor quality of the track leading to Itremo is of such poor quality that it should discourage Eco tourists to travel here, although the price of plants offered for sale in Europe could make commercial collection of plants by the truck load an attractive proposition. In other countries the tell tale signs of holes left in the desert ground tell the story. Fortunately we did not see any such signs on our trip. Unfortunately we needed to cross the river to continue our journey. 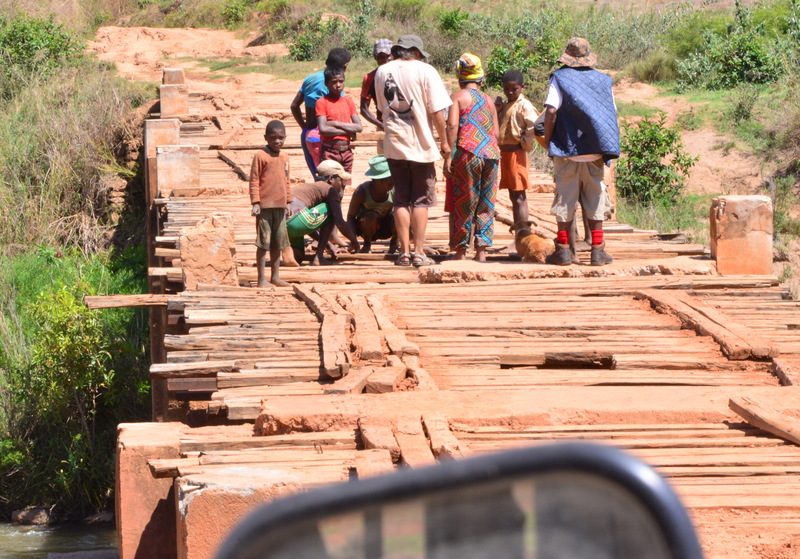 Fortunately there was a bridge, unfortunately it did have a significant number of planks missing. What to do? Jean Baptiste suggested that supply trucks pass along this road and often carry some planks to overcome such events, so suggested a wait. I managed to cross the bridge on foot and after about 500 m came across a second, longer bridge, again with half the planks missing. It should be possible to take planks from this bridge to the first bridge, fix it, cross it and then strip down #1 to fix bridge #2. The plan was communicated to the twenty or so members of the community of all ages who started the task of moving wood immediately, leaving a small team of negotiators to agree the price of the work. 10,000 ariary, about £2.50, for both bridges and an assurance that our team of bridge builders would still be available the following day to reverse the task and allow us over again for the same price. Their were signs at the second bridge suggested that this was not an entirely unusual experience for the community as a dozen ladies had set up a small cafeteria serving coffee, roasted nuts and fruits. Good to know for the return journey. 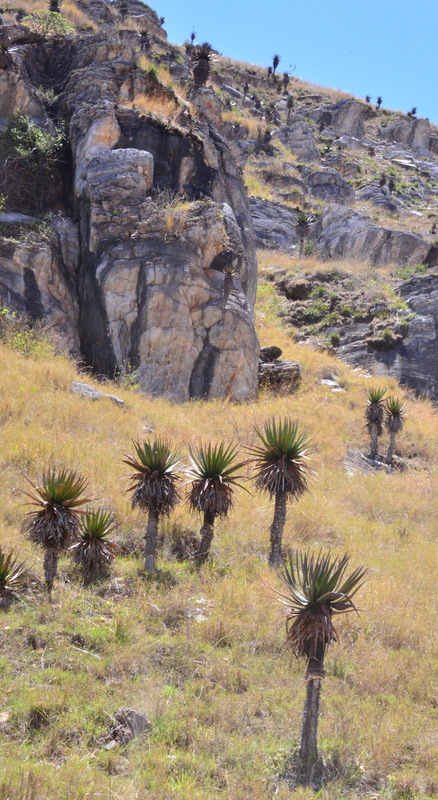 We passed a hillside with lots of tall Aloes. As the bridge incident had taken quite some time, Christophe allowed us to take some pictures from the car but promised that we’d have a longer stop on the way back, tomorrow. Not long after we entered the village that was home to the Reserve’s admin office. We reported to the admin office but there was no one home – it was Sunday. We promised to stop by the next day and promised to pay our fees then. There was even a hotel, Hotel Clement. We went into the restaurant for a nice cool Coca Cola, but although there was a fridge, there was no electricity, so it was luke warm. A crowd of people had gathered. They all seemed to know Jean who chatted with most of the adults. Field full of bulbs in flower. 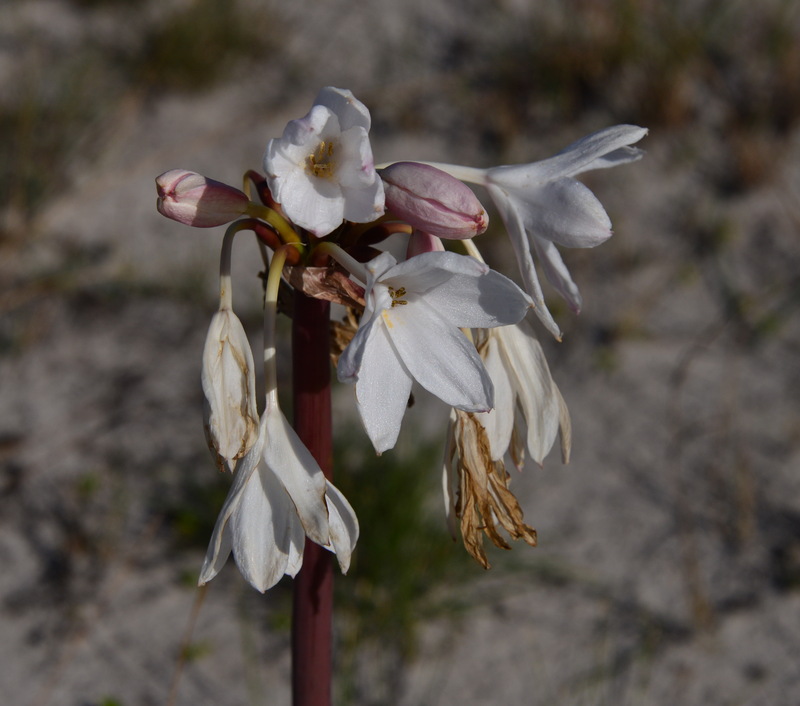 Crinum sp. in the Family Amaryllidaceous. 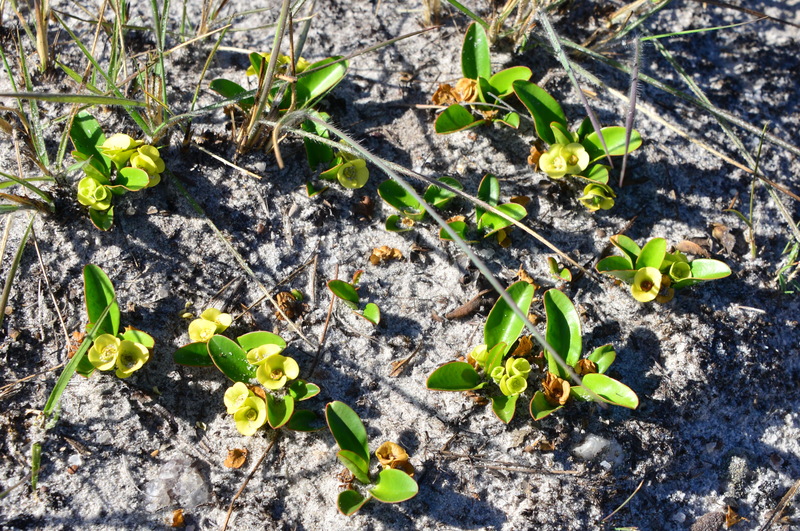 We took a lot of pictures until we noticed that these plants grew in quartz sand and pebbles and that hidden between the grass were hundreds of small plants with yellow flowers: Euphorbia quartziticola, the target plant that we had made this hard drive for! Christophe told us that our planned campsite was near by, se we drove on and were pleased that this area too was covered in the Crinum sp. and on quartz sand / gravel. And sure enough, the ground was covered in yellow flowers! John and I were sent away to let Nadia and Christophe set up the tents. I followed Jean who was collecting wood for tonight’s campfire. Where are the Eulychnia when you need them? Oh yes, in Chile. 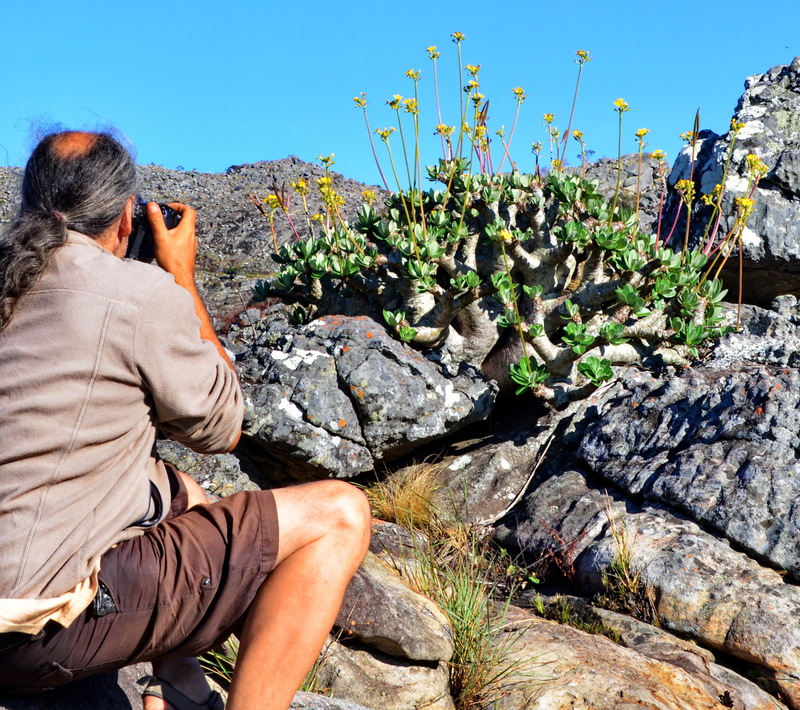 He pointed out a small area with shrubs and told me to look for Pachypodium brevicaule. Easy to find! 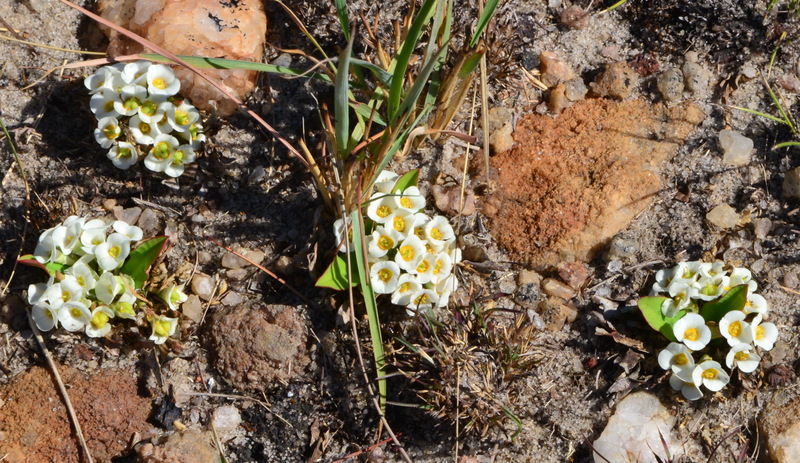 There must have been some twenty plants, partly buried, unlike the plants earlier on the trip found on Mt Ibite that were mostly growing fully exposed above ground. When I got back to our camp, the tents were up. The ground was hard as I remembered from other camping sessions and there was a distinct lack of 5 litre bottles of Chilean Cabinet Sauvignon. Nadia had brought along a small bottle of rum, so at least we toasted her dinner in style! 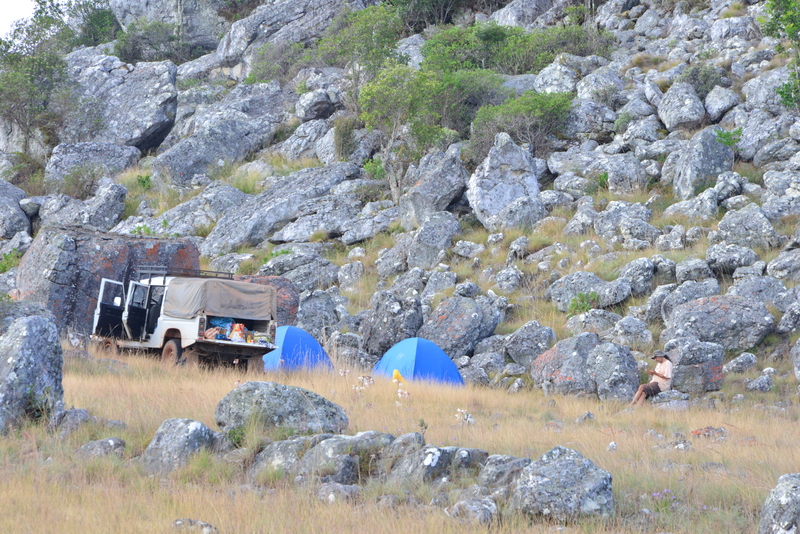 Christophe’s itinerary included one night of ‘camping, please bring a sleeping bag’. As regular readers of the Cactus Trip Diaries might know, camping is not my favourite activity in a ‘looking for plants’ trip. As usually we fly into cactus country, we are keenly aware of checked-in luggage limits, normally one case weighing 23 kg. Once you look at what is available in terms of camping equipment, it’s easy to see that the equipment can take up most of the weight allowance. The afternoon before the planned camping event has to be spent shopping for provisions, it’s best to arrive at the chosen site while there is still day light, the ground where you lay down your sleeping bag seems to get harder and less comfortable as you get older and the next morning it’s best to wait until the sun has dried off the dew that has wetted the outside skin of the tent, before packing it away. Increasingly, I wake up with a headache due to the amount of wine consumed to act as an anaesthetic to cope with the hard ground. So, as the night under canvas approached (tomorrow) I decided to ask Christophe for a bit more information. Was this event in permanent luxury tents, with beds etc? He laughed, not at all. Was there an alternative option? Not really. Ah well, it’s only for one night, but I wasn’t looking forward to it! ‘This is a peaceful hotel set on a high plateau surrounded by farmland and villages. Construction of the complex started 11 year ago by the owner and was completed with the help of the local Zafimaniry people. The hotel consists of one main building which serves as the dining hall. The rooms are small private bungalows scattered about the property. All of the buildings on the site are constructed using Zafimaniry methods, design and materials. The rooms are clean and smartly decorated. The bathrooms are small but efficient with constant hot water provide by an in-room instant gas heating system. 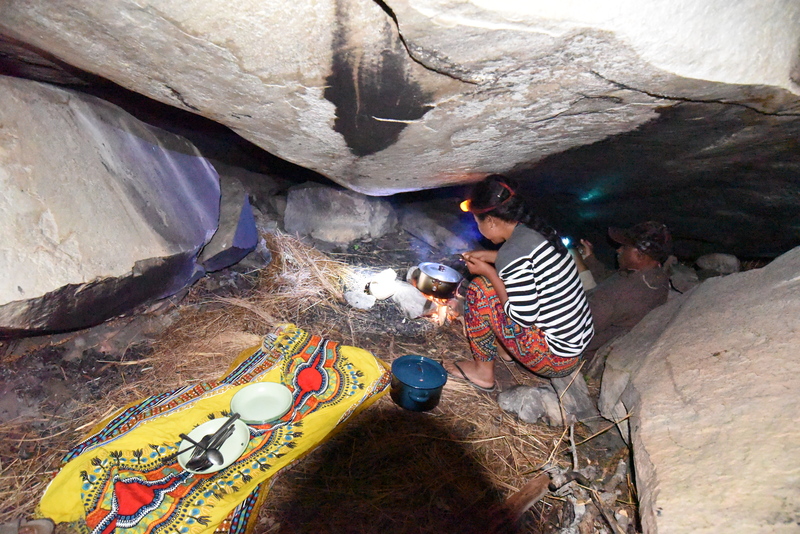 Electricity is provided via generator but only for a few hours a day. I found the bed to be quite comfortable. 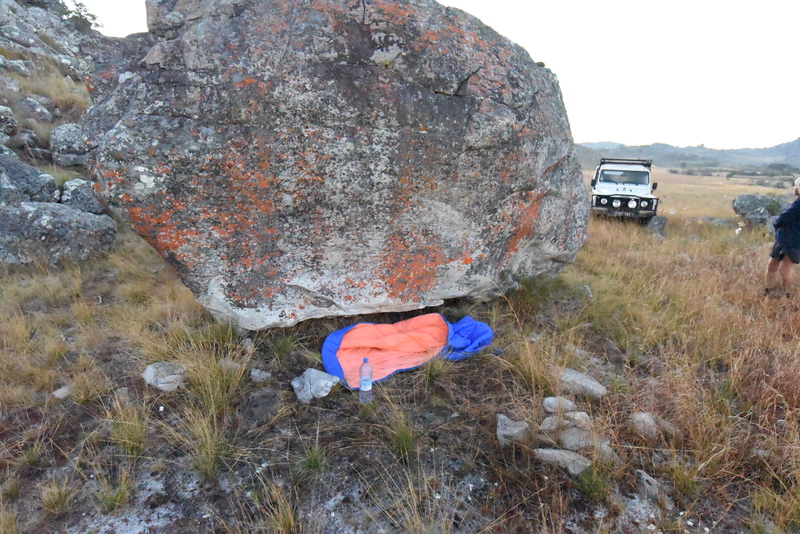 Being winter it was extremely cold but the bedding provided ample insulation for a good night of sleep. I only had one dinner at this property and both preparation and the quality of ingredients were excellent. Breakfast was less spectacular but it was good nonetheless. Service here was exceptional. Brigitte and her son Pierre are both on site and they are warm, kind people who are constantly attentive to the needs of their guests. Conversation was pleasant and guests were treated to some of their flavoured rums. The local staff whom they employ were friendly and efficient as well. The property offers opportunities to sit around a fire pit, lounge under the stars or just sit back and relax. Due to the location and availability of resources some things being very basic and availability of some things cannot be guaranteed but there is much here to make up for any lack. Definitely worth a stay.’ I totally agree! Ravenala madagascariensis, a.k.a. the ‘traveller’s palm’, native to Madagascar. 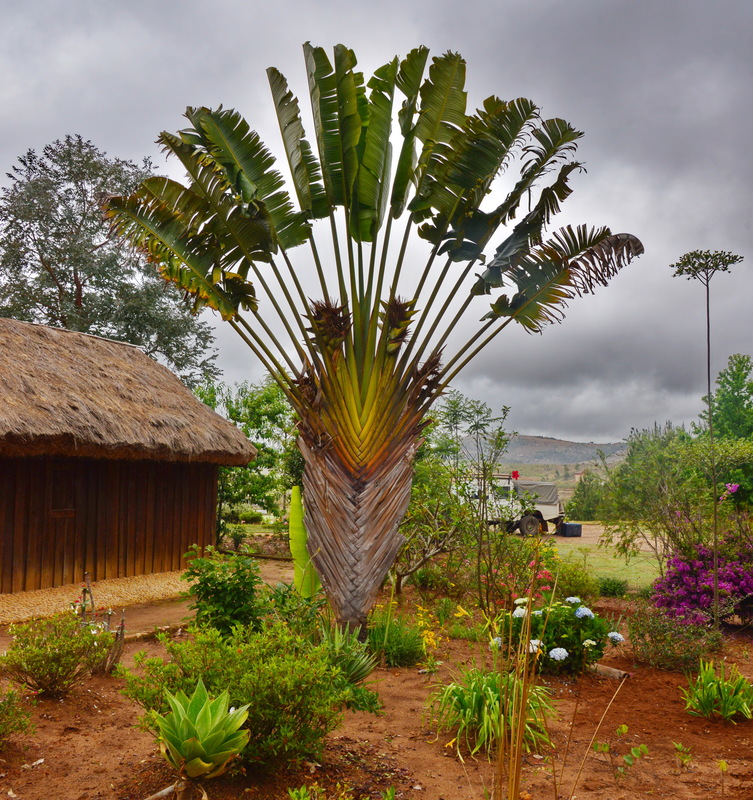 I has been looking for a nice specimen of Ravenala madagascariensis, that is native and kind off a symbol of Madagascar and here, in the garden was the above plant. It is not a true palm but is closely related to the southern African genus Strelitzia and the South American genus Phenakospermum. There was a similar plaque for Juventus. We had been bumped by the Hotel that Christophe had booked due to the arrival of a coach party of some 20 French tourists. They felt bad about the double booking, but I could see the economic sense of it. They had found us rooms in the house owned by a former Madagascar minister who had moved to the capital before she was sacked on corruption charges. The rooms were comfortable but the shared toilet and shower facilities were a little primitive with state of the art toilet, washbasin and shower – but no running water – the water pipes to the house were still stored in the garden. So there were large water tanks with smaller containers to fill up the cistern to flush the toilet or to pour water (cold) over yourself to have a shower. When we got home from dinner at the original hotel, the landlady in our hotel asked if we wanted some hot water for a shower. Thanks, but she was too late. While waiting for dinner, we witnessed guests running wrapped in bath towels from the shared shower cubicles down stairs to their rooms upstairs, past the dining room. Serves them right for pinching our rooms! I believe that last night was the first without a mosquito net over the bed. Christophe assured us that there were no mossies this high (too cold) and no standing water that is needed in the mossie life cycle. 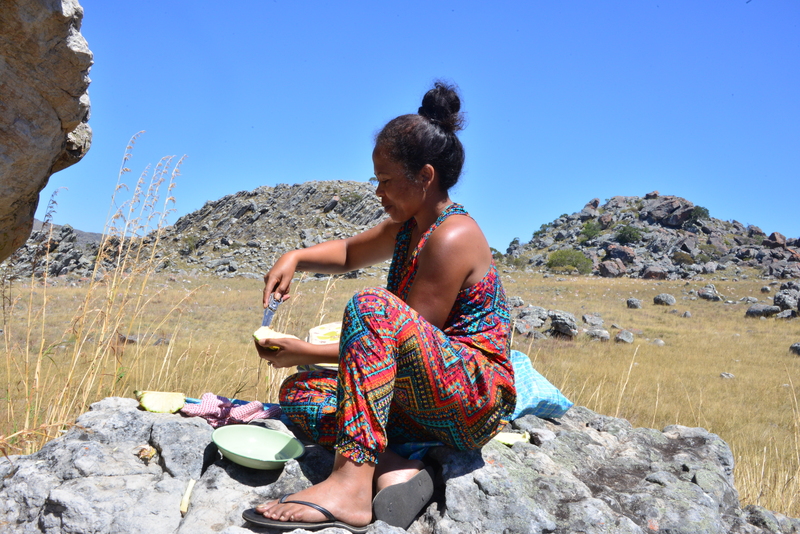 The Anja Community Reserve consists of some 30 hectare of dry forest nestled at the base of three, large granite mountains that dominate the landscape. Guides were at hand to take us on a range of walks. 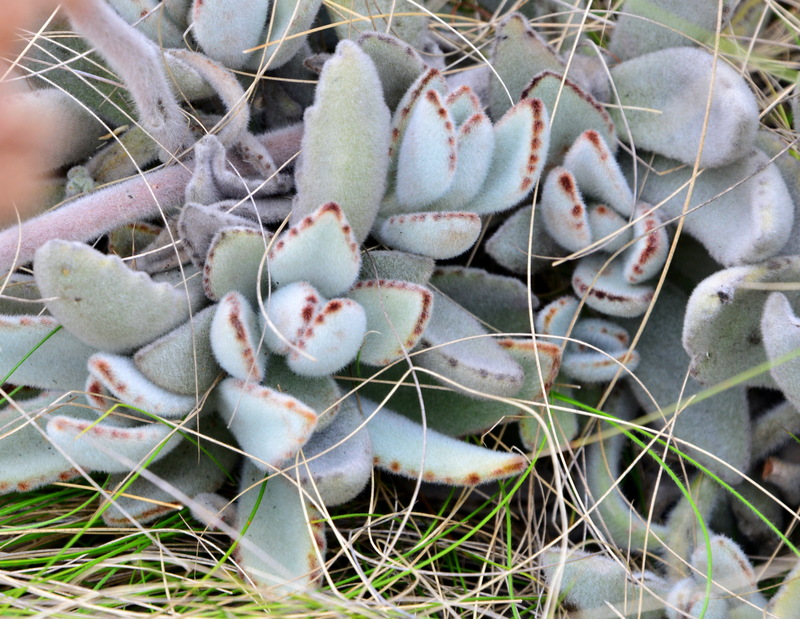 With other places to see on our way to the next destination, we opted for the short circuit, but unbeknown to us, Christophe asked for a customised extension so that we could add to our tally of succulent plants seen in nature. I looked forward to the opportunity to photograph some more lemurs but was also pleased to see an impromptu appearance of a Chameleon. Again, there were two guides, a wildlife spotter and a guide who was fluent in English and provided explanations and names of plants. The ID of Chameleons is quite tricky, due to their ability to ‘change colour’ to merge in with their surroundings, so that the one that you see can look quite different to the ones in images on the internet. And of course, it’s always difficult to tell fact from fiction on information found on the internet. With a deep interest in a specialist subject like cacti, you get to know the sites that are reliable and those that are just pure fantasy. The name Zonosaurus madagascariensis was suggested on the Anja website, but searching for images of lizards under that name shows quite a different reptile. With over 200 species of Chameleon recorded, I’ll need to look at quite a few more images before I can spot a match. 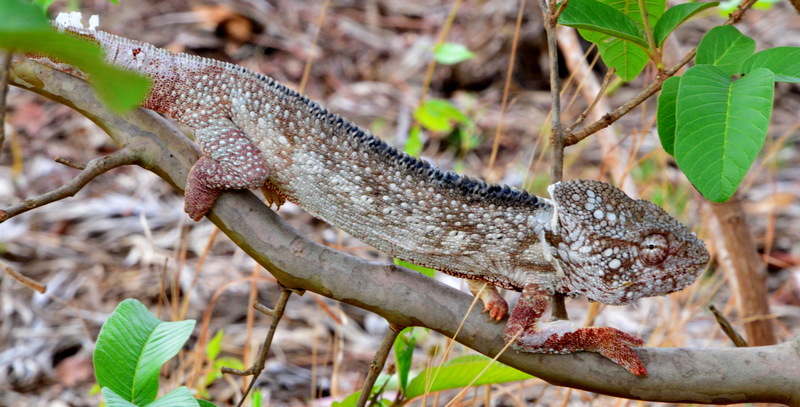 So if you are sure that you know the correct ID of this and other lizards (incl. chameleons) then I’d be glad to hear your opinions. As things must have a name, I’ve christened it Chammy again. Having found us the Chameleon in a tree, our spotter ran off again and came back with some grasshoppers that he had caught, pricked on the end of a stick and waved it some 20-30 cm from the Chameleon. Chammy would lean towards the insect and, quick as a flash, would fire it’s rolled up tongue, catch the cricket and swallow before I could focus my camera – again shooting against the light and with numerous twigs and leaves in the way was quite a challenge. All my attempts to catch the action failed. I should have tried movie mode, but how many grasshoppers can a chameleon eat before it is full for the day? 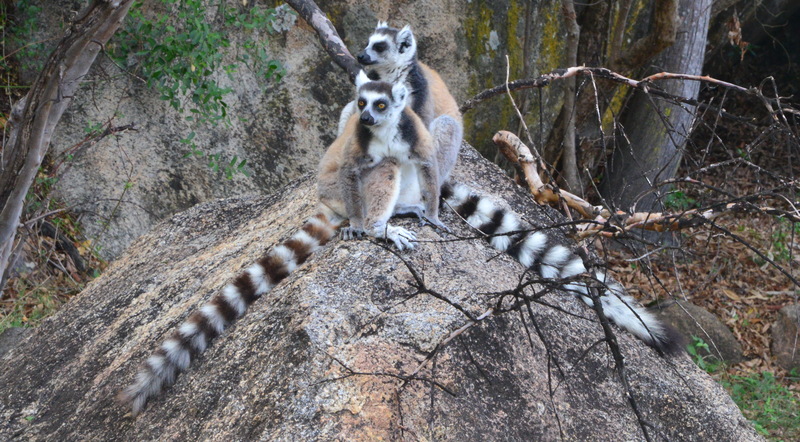 Our spotter called to tell us that the lemurs – ring tailed, i.e. Lemur catta, had arrived. 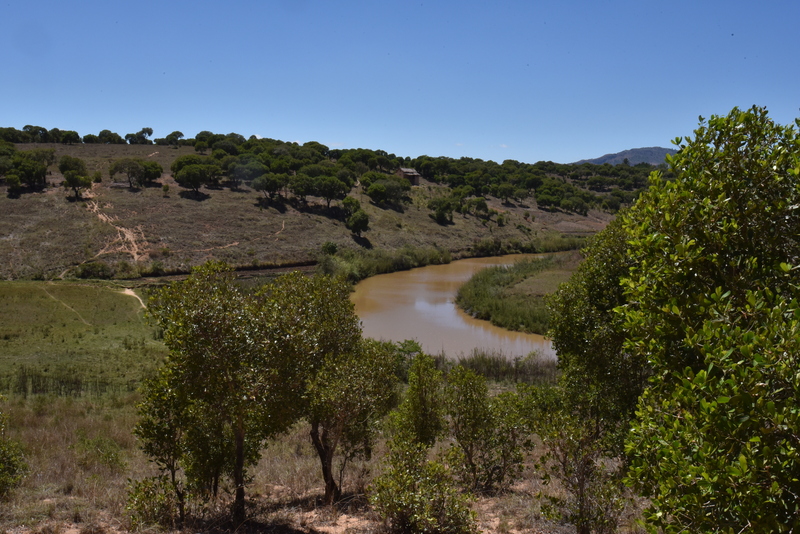 We moved to a spot at the edge of the forest where some small reservoirs had been dug that contained water. The lemurs, again, some with young on their back, had come to drink and also seemed keen to lick the rocks. Our guide explained that the leaves that Lemurs eat in the forest contain toxins and that the animals come to drink and lick the rocks for minerals that counteract the toxins. This was an ideal location for photography and I have (way too?) many images and some video as well. 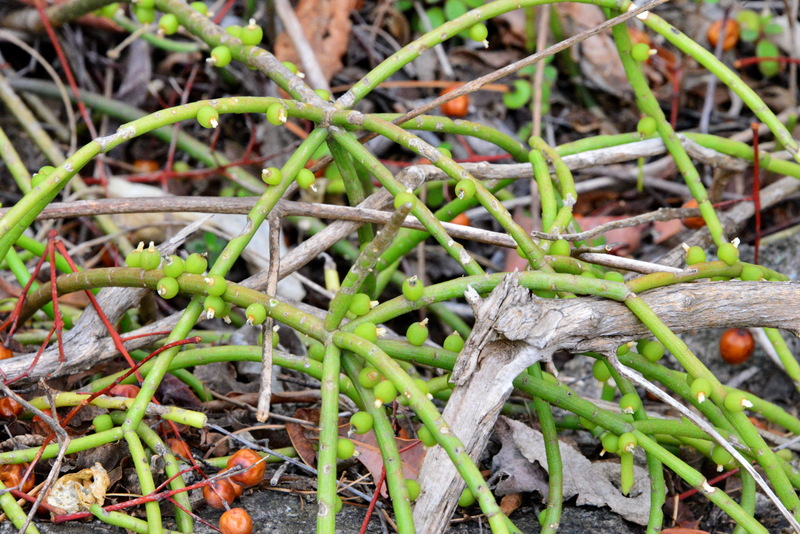 Rhipsalis baccifera is the only cactus believed to occur in nature in the Old World. It is usually accepted that the Cactaceae evolved after the earth’s surfaces broke up and the super continent, Gondwana split, simplistically creating the New World (the Americas) and the Old World (Europe, Africa and Asia). 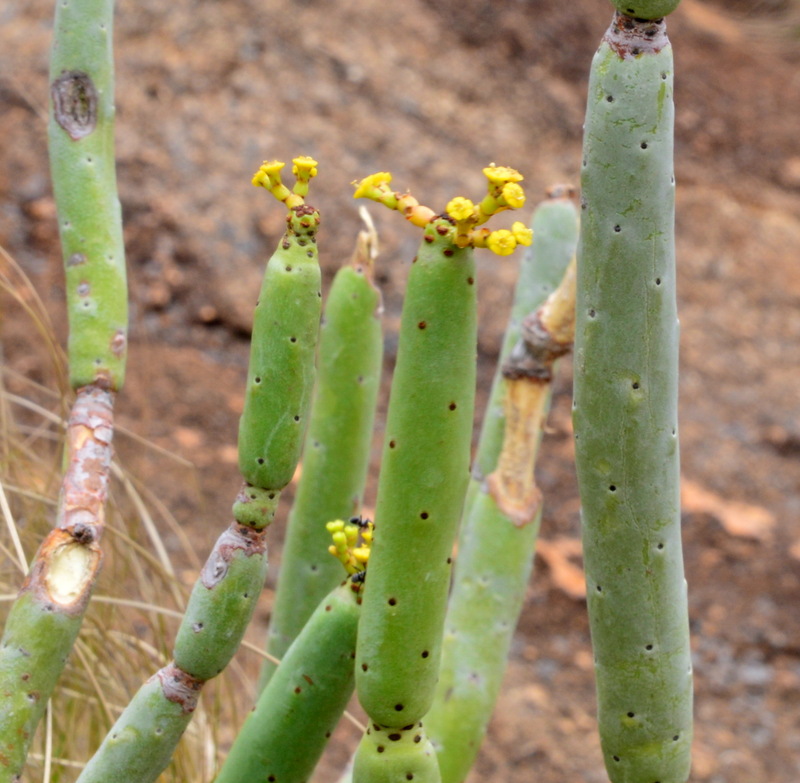 So how did this cactus get to ‘the other side’ of the planet? Discussions on the subject range from long studies and numerous scientific papers, to conversations around camp fires and meetings of cactus enthusiasts, usually accompanied by plentiful supplies of alcohol and rarely based on correct and accurately remembered facts. Definitely a plant of interest that previously I had seen in its accepted homeland of Brazil. Quite a range and number of interesting things, and it was only approaching midday! Earlier in the trip I had mentioned that I had enjoyed Chinese meals in every country that I had visited. 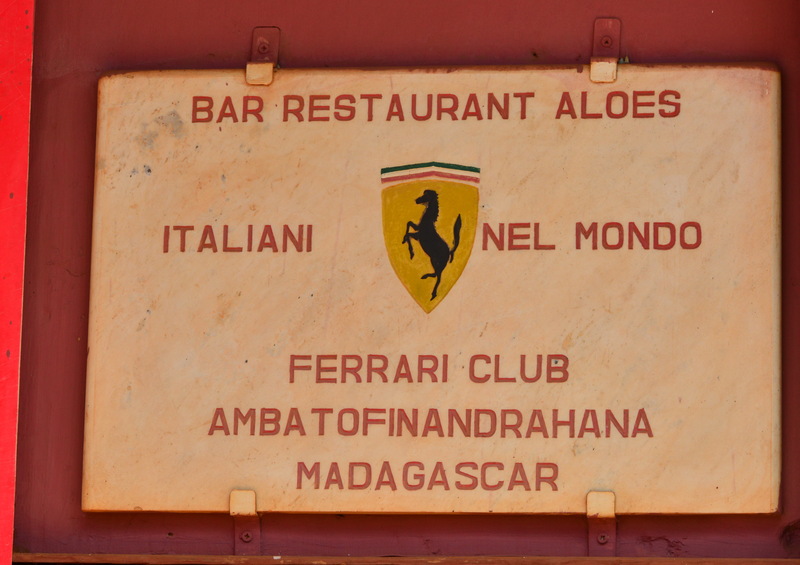 Keen to add Madagascar to the list we had lunch in the town of Fianarantsoa, where Christophe knew a good Chinese restaurant, The Panda Restaurant that even gets a 4.5 star-rating on Tripadvisor! As soon as we had stopped, we were surrounding by the usual group of kids and teenagers. Instead of begging for sweets and presents, these youngsters spoke good English and were selling post cards that they claimed that they had made at school. Where do you learn your English, I asked. At school. I explained the I was Dutch, and immediately a few of the kids switched to German! I was impressed but explained that being Dutch meant that I came from Holland, not Germany. ‘Ask me to buy cards in Dutch and I’ll buy some’, I joked. When we came out of the Chinese, a few of the kids were still there and one of them said ‘Goede morgen, heeft U een kadootje voor mij?’in reasonable Dutch! 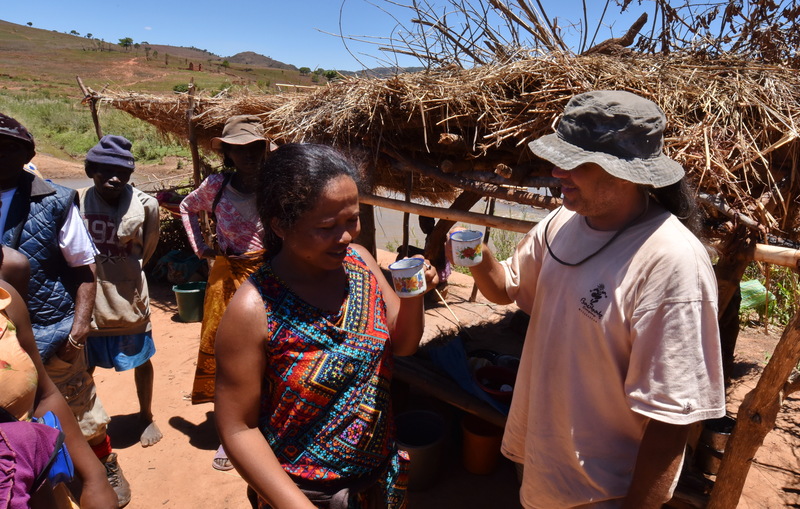 There are lots of foreign volunteer workers in Madagascar and clearly this included a Dutch or Flemish speaking person who had been consulted. Well done! Enterprising! I bought ten of his card as a reward. He was ever so pleased and has shown his friends that the best get rich. I still have to get together with John to swap our images. He may have pictures of my negotiations.